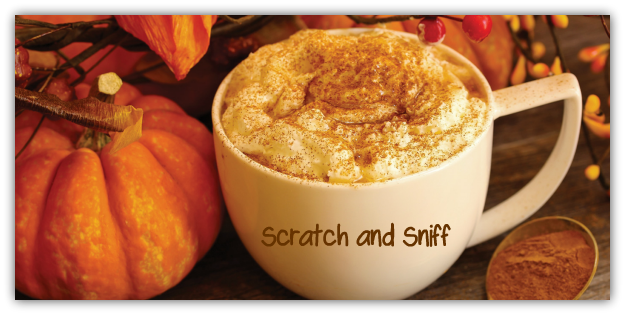 Whenever I think of my favorite season, Autumn, I immediately recall the earthy and sensual aromas of cinnamon, clove, and nutmeg. I also envision vibrant shades of orange, red, yellow, and gold -- similar to the colors you see in the above photograph of the Autumn centerpiece I made this year. However, with the exception of the two baby orange pumpkins and the yellow/orange gourd, all the other colors in this centerpiece are an imitation, created from silks that I purchased at A.C. MOORE Arts and Crafts. Normally each year, I try to create my Autumn centerpiece using real foliage from outside, but this year I had a difficult time finding it. In fact, I would say that over the past 2-3 it's been getting more and more challenging because Autumn has become so brief and anti-climatic. If I had to choose just one word to express what the foliage has been like this particular year in Philadelphia, it would be...Meh! Which is why I made this centerpiece, so that I could be reminded of how Autumn used to be -- ABUNDANT, BOLD, BRIGHT and FIERY. I think what I adore most about Autumn is how it seems to magnify all my senses; causing me to appreciate what I sometimes take for granted -- taste, sight, touch, smell, and sound. Over the past several weeks, I was able to capture just a handful of photographs of our Autumn. One night while on my walk, I looked up and spotted these loft apartment windows glowing in yellow/gold. TOTALLY reminded me of Autumn color. I noticed these colorful Autumn leaves in the cracks of the sidewalk. 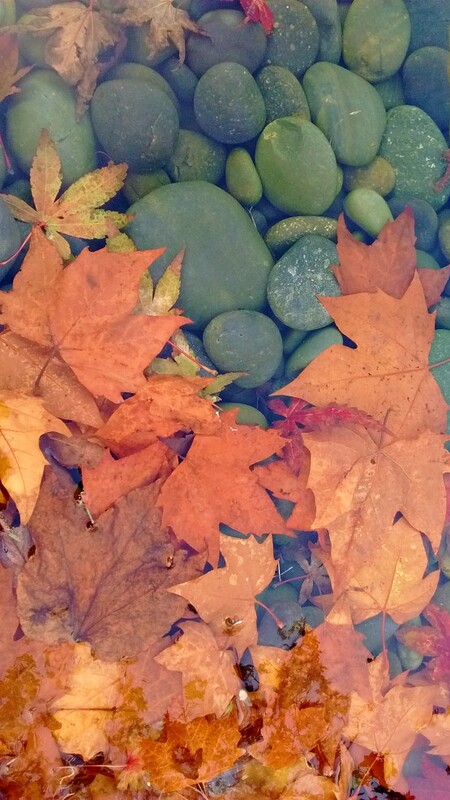 A patch of Autumn leaves floating in a river rock pool at the Barnes Foundation. I looked out my widow one early morning and watched the sun rise; giving the city a perfect Autumn amber glow. As a special Autumn treat, I leave you with something to tickle your olfactories. *simply scratch the surface of this photograph and then place your nose against your screen and inhale the aroma. Wishing you spicy weekend, y'all! Sorry autumn hasn't been as long as you would like it to be - I know how you love the season. Those big trees with red leaves are gorgeous. And I love your centrepiece! I love the centrepiece, the colour are so vibrant. I have just looked out of the window to see how the autumn colours are doing. There are enough trees for there to be a wonderful display but I was sadly disappointed to see fawn leaves instead of orange. The only bright spot was seeing Charlie running up the path. His 'orange' coat is perfect for this time of year. Hope you have a peaceful weekend, my friend. Our leaves were just becoming pretty when we had an awful (tornados in the area) storm over the weekend. Now, it's just a mess on the ground! I enjoyed your photos and I like to make fall centerpieces, too. Something different that I do is put a votive candle in glass into the middle of a small glass bowl of Buckeyes. We've had the same kind of Autumn this year as well, Ron. Spring and Autumn are my favorite seasons and they seem to be getting shorter and shorter each year. Love your photographs. Wow...what a gorgeous view you have from your apartment! The scratch and sniff LOL! Thank you, Fiona :) I love Autumn, so look forward to making a centerpiece each year. I also use a spice potpourri so that my apartment smells warm and spicy. I've been really enjoying your gorgeous Autumn photographs on your blog. Thanks :) I had so much fun making that centerpiece. I also purchased some spiced potpourri so that my apartment would SMELL like Autumn - ha! "There are enough trees for there to be a wonderful display but I was sadly disappointed to see fawn leaves instead of orange." Yes, it seems to be that way all over the world because many people I blog with are saying the same. "The only bright spot was seeing Charlie running up the path. His 'orange' coat is perfect for this time of year." Thanks so much for stopping by, my friend. Hope you're feeling well and pain-free. Have a lovely weekend! Ron, I totally empathize with your impressions of this year's Fall -- meh, indeed! You know, we've probably become spoiled over the past few years, with the glorious colors. Maybe Nature is sending us a reminder not to take her for granted and to treat her with more respect! I love the photos you've captured here. That tree at Independence Hall is going to be spectacular in a few days (once the cold arrives). Most of our trees are looking better now that we've had a chilly snap and our first frost. 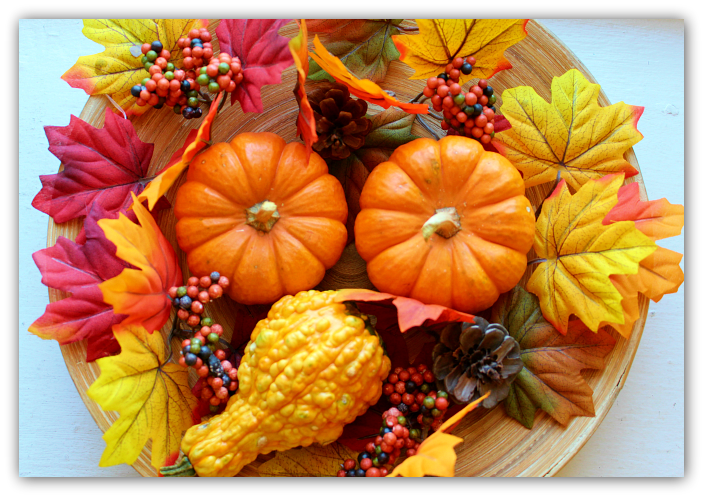 Love your homemade centerpiece, too -- very autumnal and creative. Isn't it wonderful how realistic silk articles can be when combined with touches of real things? "Spring and Autumn are my favorite seasons and they seem to be getting shorter and shorter each year." Yes, I agree. And not only shorter, but also so lack luster in color. Sad. One of the great things about my apartment is that although I live in a small studio, I have four huge windows that over look the city, so it makes my space seem larger that what it really is. "Our leaves were just becoming pretty when we had an awful (tornados in the area) storm over the weekend. Now, it's just a mess on the ground"
Aw....that's so sad. I remember when I was a kid, such vibrantly bright and colorful leaves all through October AND November. But I think that has a lot to do with the climate change that's been happening over the past 10 years and how bi-polar the temperatures are - it's hot, then cold, then hot, then cold again. It's getting to the point where you can't even tell what season we're experiencing!?!
" Something different that I do is put a votive candle in glass into the middle of a small glass bowl of Buckeyes." Oh how NICE!!!!! I bet that looks awesome! "Guess what? I'm going to make a special trip out to Trader Joes in the next week. I always think of you because I know how much you like to go there and get pumpkin stuff!" HA! OMG...I started getting all the pumpkin stuff at the start of October because I get so excited and want to try them ALL before they discontinue them. I freaking LOVE anything pumpkin! Thanks so much for stopping by, my friend. Have a faaaaaaaaabulous weekend! P.S. We got some really cold weather today, so it finally feels like Autumn! I know, hasn't this year's Fall been so uneventful? And it's a season I SO look forward to, yet it seems to come and go so fast, and with very little luster.
" You know, we've probably become spoiled over the past few years, with the glorious colors. Maybe Nature is sending us a reminder not to take her for granted and to treat her with more respect!" Yu, I think you're absolutely right. Gosh, I miss how the seasons used to be very distinct and definite. Now they seem to all blend together. "That tree at Independence Hall is going to be spectacular in a few days (once the cold arrives). Most of our trees are looking better now that we've had a chilly snap and our first frost." Funny you mentioned that because just today we got a nice COLD snap, so I'm sure those trees will be more vibrant in the next couple of days. "Isn't it wonderful how realistic silk articles can be when combined with touches of real things?" 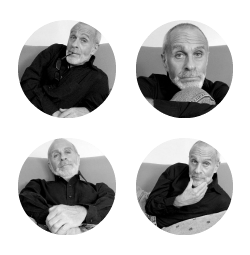 Hey, Ron, great photos as always. I especially liked the one from your apartment window. The centerpiece looks fabulous! I've been hearing from a lot of people that the fall foliage in the Northeast hasn't been so good this year. Luckily we have your creative talents! Have a great weekend, buddy, and keep snapping those photos! 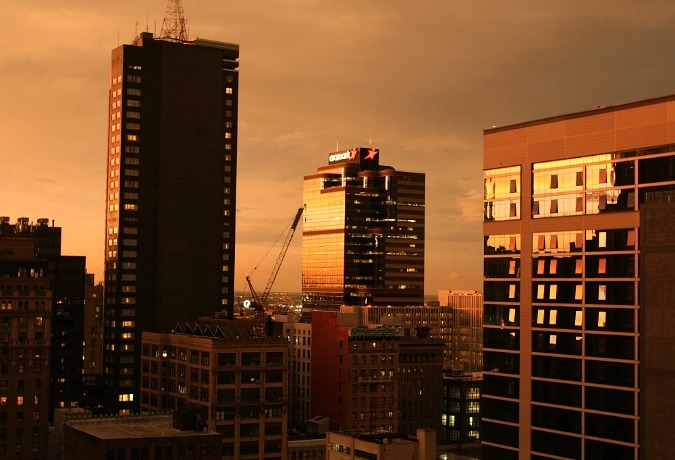 I don't normally get up early enough to witness a sunrise, but it just so happened the one day (on my day off) I woke up very early and decided to make myself some coffee and when I opened blinds on my apartment windows, I saw that beautiful amber glow reflecting off the buildings. So I grabbed my camera and took about five photographs. "I've been hearing from a lot of people that the fall foliage in the Northeast hasn't been so good this year." Yes, me too. And not only in the Northeast, but all over the U.S. The foliage this Autumn hasn't been good. Thanks so much for stopping by, buddy. Have a fantastic rest of your weekend! I think your scratch 'n sniff photo is defective, Ron. I tried it but all I can smell is plastic. What a shame to hear about the lack of Autumn foliage out your way this year (and the past several). I know that the intensity of the colors is dependent upon weather conditions and can change from year to year. I have to say, in the PNW the colors have been especially vibrant this year, interesting given our cold/wet winter followed by a hot/dry summer. I wonder if there's a correlation? In any case, love your centerpiece and the way you spotted indoor lighting that reminded you of the colors of the season. Well done, sir! Bwhahahahahahaha! Mark, that CRACKED me up! You are so funny!!!! I know, this Autumn's foliage has been such a let down, considering that I wait all summer long for Autumn. "I have to say, in the PNW the colors have been especially vibrant this year, interesting given our cold/wet winter followed by a hot/dry summer. I wonder if there's a correlation?" Yes, there could be a correlation. We've only just now (the past four days) have gotten a really good cold snap. But Sept AND October have been unusually warm and very humid, which is why I think we've had such a wimpy Autumn. Thanks so much for stopping by, buddy. Have a fantabulous weekend! Ron, regardless of how anti-climatic your Autumn has been, your photographs are gorgeous! I especially love the pictures you shot of the leaves in the cracks of the sidewalk. Beautiful colors! 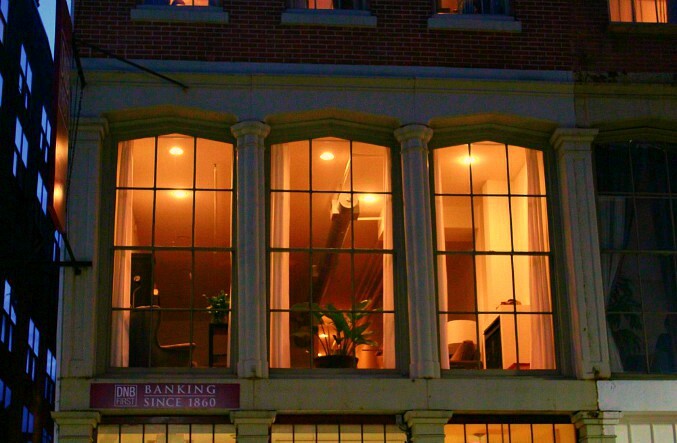 The picture of the glowing loft apartment windows looks like it was taken for House Beautiful. Reminds me of SoHo, New York. Autumn is the season I miss most not living in the Northeast. It's just not the same in Florida. I know you love the cold weather of Winter, so I hope you get some and have a white Christmas this year. Can you believe that Thanksgiving is almost here? Thank you :) I spotted those leaves while walking through City Hall last week. Yes....those windows such do look like SoHo, you're right! And it's funny you said that because Old City (which is where I took that shot) resembles SoHo. I love being back in the Northeast again because as you said, Autumn is just not the same in Florida. Over the past 3-4 days, we got hit with a really nice cold snap. In fact, I had to bring out my winter jacket and gloves today because it was quite chilly walking to work this morning. But OMG...did I enjoy it!. I can't wait for SNOW! It suddenly dawned on my yesterday that Thanksgiving is NEXT week?!? I think what I adore most about Autumn is how it seems to magnify all my senses; causing me to appreciate what I sometimes take for granted -- taste, sight, touch, smell, and sound. Yes! I believe you hit the nail on the head! Love your centerpiece...silk or real, it's beautiful. The nice thing about silk is you can enjoy it year after year. Spice potpourri or some mulled cider on the stove would be a perfect accompaniment. Your photos are really gorgeous. I've always liked the trees when they're in the various stages of turning. Also LUUUV the leaves in the cracks of the sidewalk. Those shots are always full of intricate details. Maybe when you're moved into NYC, you can take a leaf-peeping trip around New England during Autumn's 2018 show. :-) Take care and be well. Thank you:) Each Autumn I enjoy bringing the outside inside, by making a centerpiece. I even have leaves sprinkled throughout my apartment - on my tables, bookcase, window ledges. I even use "Spice" potpourri so that my place even SMELLS like Autumn! Autumn seems to awaken and magnify all my senses; reminding me to be grateful for so many things in my life.
" Maybe when you're moved into NYC, you can take a leaf-peeping trip around New England during Autumn's 2018 show." What a GREAT idea! And I may just do that! Thanks so much for stopping by, my friend. Have a FAB rest of your week! 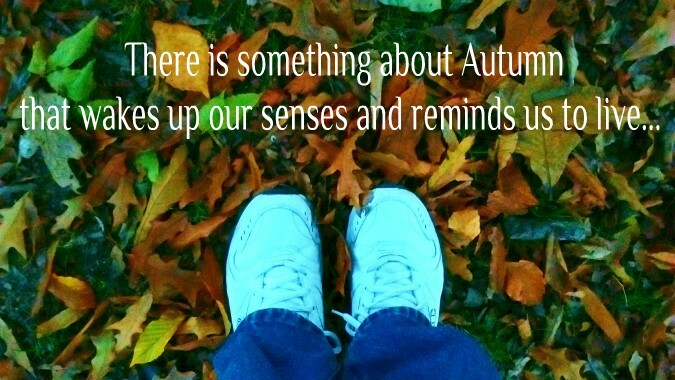 Ron, I love what you said about Autumn magnifying your senses. That's not only beautiful but so accurate. Don't you just love this time of the year? The cooler temperature, the clothes, the smells, and all the comfort foods? When I was a kid still living out in the suburbs of Long Island, I remember the Autumn foliage being so vivid and lasting so long. Now, it comes and goes so quickly and not nearly as dramatic. Gorgeous photographs! I love the one of the leaves and river rocks. And what a view from your apt. window! Hasn't the colder weather been glorious? It's feels so nice to finally wear my fall clothes! OMG...yes...I LOVE, LOVE, LOVE all the comfort foods this time of the year! In fact, I was just talking about that with one of my coworkers last week. I love the warms soups, stews, breads and drinks. All I want to do is EAT and EAT this time of year! "Hasn't the colder weather been glorious? It's feels so nice to finally wear my fall clothes!" Yes, FINALLY! It was so cold these past several days that I had to bring out my down jacket, scarf, and gloves. It feels so good to walk outside in the crisp cold air. This is truly my FAVORITE time of the year! Thanks so much for stopping by, neighbor! Enjoy the rest of your week!!! P.S. Can you believe that Thanksgiving is next week?!?! You are so right about the colors. I've been waiting for the palm trees to turn color at home, but I guess it just isn't going to ever happen. Same thing with the cactus thorns also! The centerpiece is also beautiful. You are very creative at everything you do it seems. Ron, the most beautiful Fall I ever experienced was about 6 years ago when my girlfriend and I drove up to Vermont for Thanksgiving. Never have ever seen such incredible foliage, the colors were unreal! You're right, we haven't had a good Autumn season in a long time. Your pics are wonderful, as usual. My faves are the leaves in the cracks of the sidewalk and the river rocks. You've got such a beautiful view from your apartment, dude! "I've been waiting for the palm trees to turn color at home, but I guess it just isn't going to ever happen. Same thing with the cactus thorns also! " Have a great weekend, my friend, and thanks so much for stopping by! "I ever experienced was about 6 years ago when my girlfriend and I drove up to Vermont for Thanksgiving. Never have ever seen such incredible foliage, the colors were unreal!" OMG... and I bet the foliage was STUNNING! You know, that's one of my wishes - to experience Autumn in Vermont. I used to know a woman who had a part-time home in Vermont and she said Fall was AMAZING! She always referred to Vermont as, "God's Country!" Even though my studio apartment is very small, I've got four BIG windows that overlook the city, so it gives the feel that it's much bigger. Thanks so much for stopping by, buddy. Have a most awesome weekend!